Parameters - Basic The Category List Layout has the following Basic Parameters, as shown below. # Links. The number of Articles to display in the initial view. If a Category has more than this number of Articles, only this many links will show on the first page. In this case, the User can either change the "Display #" in the drop-down list box or use the "Next" link to show the next page of Articles. Date Column. 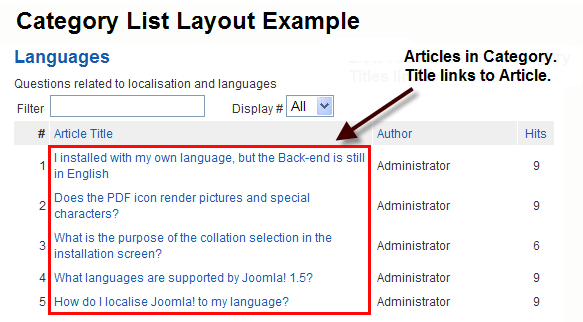 Hide or Show the Created Date for the Article in a column between the Title and Author. Date Format. The format of the Created Date. You may leave this blank to use the default date format from your Language file. This value uses the PHP strftime Command Format. Filter. 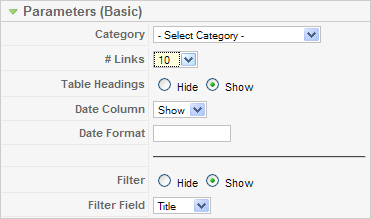 Hide or show a Filter form. A Filter allow the user to limit what Articles are displayed. An example is shown below. Filter Field. Field to use for filtering Articles. Available options are Title, Author, and Hits. Parameters - Advanced The Category List Layout has the following Advanced Parameters, as shown below. Display Select: Show or Hide the Display # drop-down list box. This allows you to limit the number of Articles listed on one page. This page was last modified on 13 July 2010, at 09:45.